There seems to be a myriad of different types of 3D printer filament available to buy, so the question is what are the different types of 3D printer filament and what can they be used for? ABS is a good all round printer filament. As a material it is noteworthy for its toughness. Something that you will be familiar with which is made from ABS is Lego. Additional advantages of ABS are that it can produce a good finish which can be improved (smoothed) with an acetone vapour treatment. To print with ABS filament your 3D printer will require extruder temperatures of 210-255°, using lower temperatures can result in the increased incidence of blockage of the extruder. It also has good temperature and impact resistance making objects or parts 3D printed with ABS less prone to deformation post production. However, it is prone to warping on the printer bed and so is not ideal for objects that need to be flat though the warping can be ameliorated by using a heated printer bed. It is also petroleum based and so is not considered to be as environmentally friendly as filament alternatives like PLA. A marked advantage of using PLA for your 3D printing jobs is that it is a bioplastic, derived from renewable resources like corn or soya; it is essentially made from starch. For 3D printing PLA does not suffer so readily from warping and so does not require a heated printer bed. Post-production it is more resistant to UV light. It also reaches a runnier state of liquefication than, for example, ABS, it becomes malleable at ~60°, this lower temperature also means that a lower extruder temperature than ABS is required at ~ 180-210°.. This property results in greater bonding between layers. If actively cooled it can result in sharper, more accurate, detail. PLA can be sanded to give it a finished, smooth, look. PLA can also be used to make casts in a process called Lost PLA Casting. A PLA object is encased in a plaster mold and then molten metal is poured into the mold burning away the PLA. PLA is a very good 3D printer filament to buy to use in schools and colleges. One disadvantage is that PLA has a higher coefficient of friction which means that it is harder to push through the extruder. This can lead to issues with feed rate but varying the extruder temperature can help with this. PETG is a versatile 3D printer filament that is strong, rigid and lightweight with good impact resistance. PETG printer filament is a clear thermoplastic although due to the layering it is never truly transparent, the transparency is broken up by the bonds between the layers. Its working temperature range is from 160-210°. A good advantage of using PETG is that it is fully recycleable. PETG is also used for food containers, therefore filament like Colorfabb’s XT or Taulman3D PET Natural Filament is FDA food contact approved. There are a couple of forms of filament mixed with wooden particles. This can give you an attractive wood effect object that can be vanished and sanded like wood. It is a bit like 3D printed MDF. The wood fill filaments have between 30-40% wood particles mixed with a plastic base. There can be issues with clogging depending upon the size of the wood particles used, a larger extruder nozzle would be required for larger particle sizes to prevent clogging. But, in general they a easy to work with, stick to the bed easy and show little warping. You can change the darkness of the wood by altering the print temperature, hotter temperatures give a darker wood effect. The working temperature range can vary depending on the manufacturer but is quite high, similar to ABS. Wood fill 3D printed objects are not strong though, it is softer than 100% plastic filament. Current forms of wood filament are ColorFabb’s WoodFill and Orbi-tech’s Laywoo-D3. Also in this section we will mention Straw and seaweed based filaments. It is made using the same concept, rather than wood particles it uses straw or seaweed. These filaments are softer like wood fill filament. Jiangsu Jinghe Hi-Tech Co have developed the Straw based filament, it does not appear to be available yet but they report it as being a cheap alternative to ABS and to be a strong material. The seaweed filament is also currently unavailable, it has been developed by Le Fabshop and Algopack. Metal effect 3D printer filaments are, like wood effect filaments, made from thermoplastic embedded with metal particles. Metal fill filaments can produce a very nice effect and are very good for making jewellery and statues. Generally speaking if sanded and then polished with copper polish a very nice effect can be achieved. They are best used with all metal hotends and steps should be taken to increase the flow rate of the filament by 4-8%. Common versions of metal effect 3D printer filament are ColorFabbs BronzeFill or CopperFill speciality filaments. Lay-ceramic is a great addition to the host of materials being developed for 3D printers. It allows you to 3D print a ceramic object that can then be fired in a Kiln and Glazed. However you may have to hold your horses as it is not that straight forward to print with. Your 3D printer will need some modifications to manage the feed and state transition of the material. A full metal hot end, the part that heats the filament to the desired temperature, is recommended for quick and controlled heating. Also a good quality Hobbed bolt. The Hobbed bolt feeds the filament through the hot end. Lay-ceramic is quite viscous and so has high resistance to be pushed through your extruder set up. Additionally a filament heater and a good cooling fan set up are recommended. Lay-ceramic is not for the beginner. Lay-brick is an alternative that is a plastic/chalk powder mix filament. It has a working range of 160-190°, the higher the temperature the rougher the finish. Cooling fans are needed at higher temperatures. The filament is easy to print and has similar properties to PLA. It does not require a heated bed but it is very brittle. It is a good material to print ornamental objects. HIPS or High Impact Polystyrene is a strong, heat resistant thermoplastic used extensively in the food packaging industry. 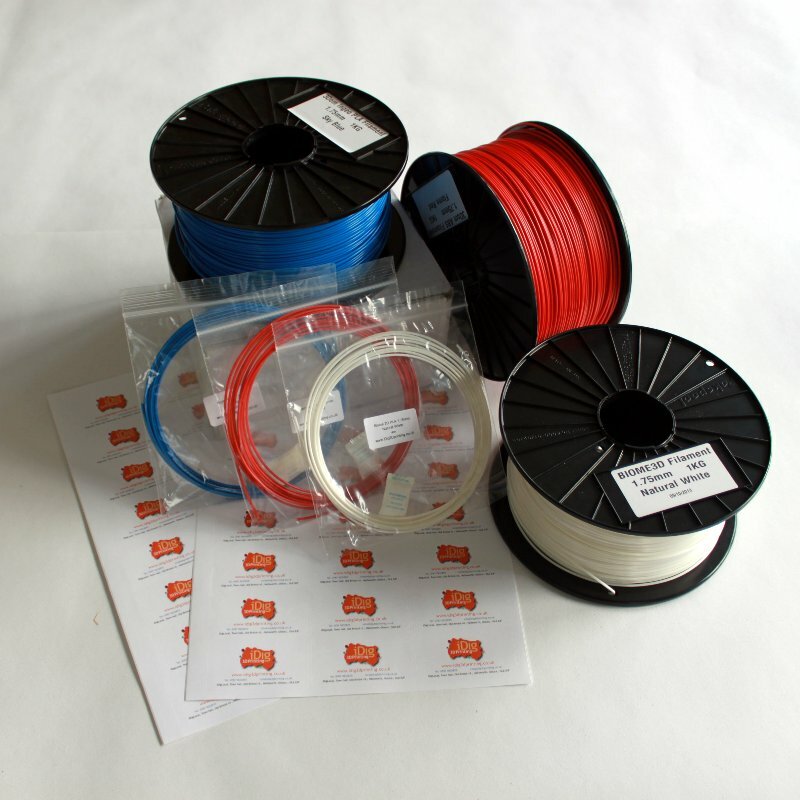 It is a very good 3D printer filament with similar printing properties to ABS. But it has a very useful difference in that it is dissolvable with Limonene, a colourless hydrocarbon. This property makes HIPS an ideal partner to ABS for building support structures for complex ABS models. The HIPS supports can be dissolved away leaving the ABS model. It has quite a high extrusion temperature at ~230° and like ABS ideally requires a heated bed. Also with HIPS it is important to let it cool properly as it remains pliable for a long time. PVA is used in a similar way as HIPS for support structures used in the build of more complex structures. However, PVA is the companion for builds with PLA rather than ABS. The advantage of PVA is that rather than the need for a rather smelly hydrocarbon to dissolve it it will dissolve in cold water. However, PVA needs to be stored very carefully as it is hydrophilic and will attract ambient moisture that will deteriorate the material. It therefore needs to be stored in a sealed container, preferably with silica. Its working range is quite narrow as well between 170-190°. There is a lot of development going on in the 3D printing world and things are changing fast. PolyMakr are currently developing additional wood and flexible filaments. Also there is a great variety of mixed filaments, both PLA and ABS being mixed with additional materials to enhance the filaments properties, whether it is strength or heat resistance Proto-pasta has a good example fo products for this. We also very much like the concept of Hyrel”s Emulsifiable Extruder (EMO-25). This is a great direction for 3D printing. Hopefully we will keep this page updated and augment iDig 3D printing’s 3D printer shop with new types of 3D filament to buy.